Vira, the sister of Ukrainian pilot Nadiya Savchenko who is being forcibly held in Russia – hopes that on October 6th she can get permission to visit with her in Novocherkassk prison. Soon there will be another hearing in the case fabricated against the Ukrainian by the repressive Russian system. Vira Savchenko talked about this in exclusive comments to the Observer. “Nadiya’s friends, those who received permission to visit her, are now in Novocherkassk. That is, 2 people: the assistant to the People’s Deputy, Oleh Mezentsev, and another friend of Nadiya’s –Valery. While I was flying around the US, the lawyer asked them to go to Nadiya and to support her. 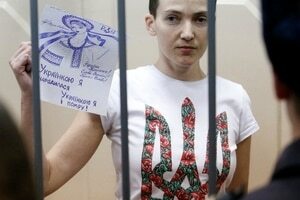 What is most lacking for her in jail is some Ukrainianness: our language, food, communication with our people; alhough in Novocherkassk there is more of this than in Moscow, ” – she said. Vera Savchenko said that Mezentsev was officially formalized as an assistant to the People’s Deputy [Nadiya, who is an MP]. “Oleh is military: he was in the ATO [anti-terrorist operation], fought on Savur-Mohyla. They have corresponded for a long time, but met recently. Once we went together to visit Nadiya. It’s not a romantic relationship, they are just friends. She clings to people from Ukraine like a drowning man clutches at a straw. In meetings it is very noticeable, “- the sister acknowledged. This entry was posted in #Free Savchenko, English News, War in Donbas and tagged #FreeSavchenko, #FreeThe20, #LetMyPeopleGo, #Nadiya Savchenko, #RussiaInvadedUkraine, #StopRussianAggression, #UkraineUnderAttack, Human Rights, Ukraine. Bookmark the permalink.